Give your wife a special message on your anniversary with this stylish greeting card from Paperlink's Love & Laughter range. 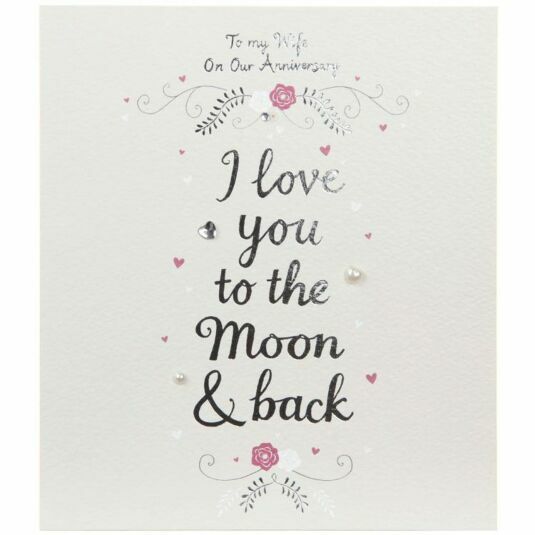 The message on the front of the card is written in reflective silver writing and reads; “To my Wife On Our Anniversary, I love you to the moon & back”. It comes with raised diamante hearts for an extra sparkle. The exclusive handmade card comes complete with a white envelope. Paperlink are one of the greeting cards industries market leader of contemporary and humorous cards. Founded in 1985 the Paperlink collection has grown for all occasions, with beautiful imagery or funny cartoons there is a card for everyone!